Here's a preparation for mussels from south of the border. 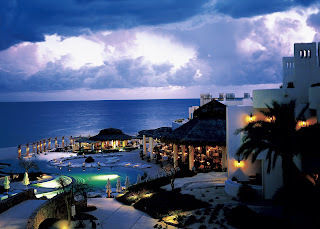 The Five Diamond Mexican resort La Ventanas al Paraiso in Los Cabos is on most of the world's best-of lists. Since its opening in 1997 it has hosted the rich, famous and infamous, satisfying their every whim and valiantly guarding their privacy against paparazzi. 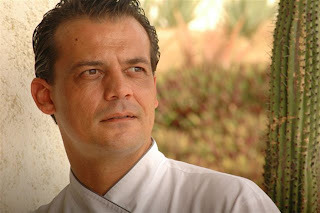 Executive Chef Fabrice Guisset, a native of France, fell in love with Mexico or, to be more precise, the senorita he married. For 13 years Chef Fabrice has turned his classical skills to Mexico's native bounty, thus this recipe that simmers mussels in tequila rather than wine. Fortunately, we don't need Ventanas' wood-burning oven to recreate one of his most popular dishes. 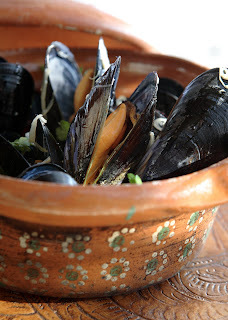 Thoroughly clean the mussels and place inside a large clay pot with lid (any oven-proof pot with a lid will do). Pour the tequila over the mussels and add the cherry tomatoes and the chilies. cover the pot and cook in the oven for 15 minutes. Remove, top with chopped herbs and mix in well. Discard any mussels that have not opened and serve immediately in clay bowls. As Chef says, Buen provecho. Mussels are the chameleons of seafood, lending themselves to a variety of preparations while maintaining the integrity of their flavor. No surprise then that I've run across two wonderful recipes this month. Here's one from Chef de Cuisine Erik Forrest of The Grill at the Fairmont Scottsdale. 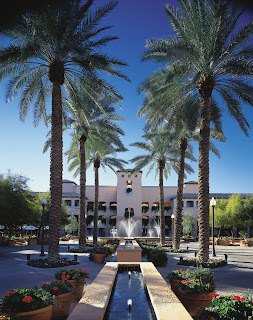 Wherever you want to go, chances are a Fairmont Hotel arrived first to offer fine food, accommodations and activities. It calls for two ingredients your grocery store might not have. Chistorras, the sweet and spicy sausages from Spain can be ordered at www.sales@hornerofinefoods.com. Salt Spring Island Mussels are the meaty Mediterranean variety and can be ordered from a number of Canadian suppliers including www.lobsterman.com. · Sweat garlic, shallot and chistorra sausage 3 to 4 minutes on medium heat, taking care not to add color. 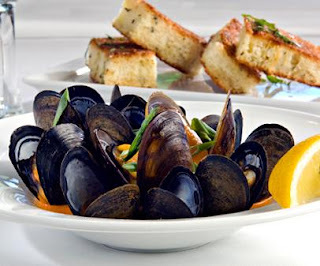 · Add mussels and deglaze with white wine. · Cook until mussels just open. · Add tomato and butter. · Toss with parsley and adjust seasoning with lemon juice and salt to finish. Rub brioche with garlic butter and brown on both sides. Our favorite Atlanta-based traveling foodie Kristi Casey Sanders shared this demonstration encountered during a green-oriented trip to Portland, Oregon. Paley's Place, one of the city's favorite restaurants, features innovative cuisine from local, organic and sustainable ingredients. Much lauded Chef Vitaly Paley - his recipes have been featured in O, The Oprah Magazine - whipped up this five-minute gnocci as the travel and food writers watched. So, for a different kind of post, watch on.